I am a total Van Halen purist, so I am glad to see Dave back, but I cannot get into this song at all. My husband says it grows on you, but I'll wait and see what the second single sounds like. I guess I really hate the whole "swap meat salad, tramp stamp tattoo" line. 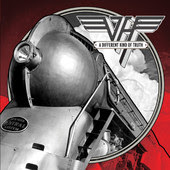 Van Halen are still making records? Whaaaat. Damn DLR--grow your hair out again, dude.